Altitude:approximately 1000 meters above sea level. 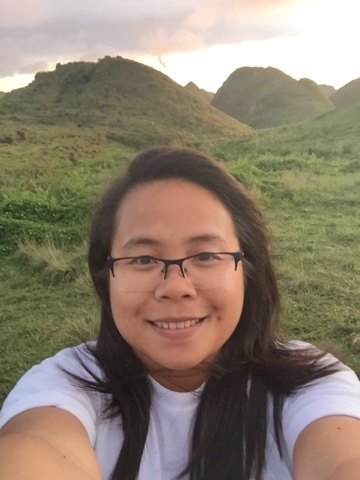 It is known to be the highest peak in Cebu. Seeing many friends visit it, made me curious of what’s up with this O.Peak!?! I see mountains and a beautiful scene in each photos, therefore #ByaheNgKokobears signed it off to be our Cebu adventure for this vacation together with the current hit Canyoneering. Of course it requires research, question and answer from family & friends who have gone there and blogs that provides information about this site. We learned that you could actually go there directly even without an adventure agency to guide you. All you have to do is ride a 3-hour bus to Dalaguete. Ride habal-habal (motorcycle) for an hour up to Mantalungon market and from there, locals – actually children, could be your guide on the way up. (Of course you just have to give them tip). But in our case we have contacted Highland Adventures and got an Osmeña Peak + Canyoneering package at 2200 Php each. 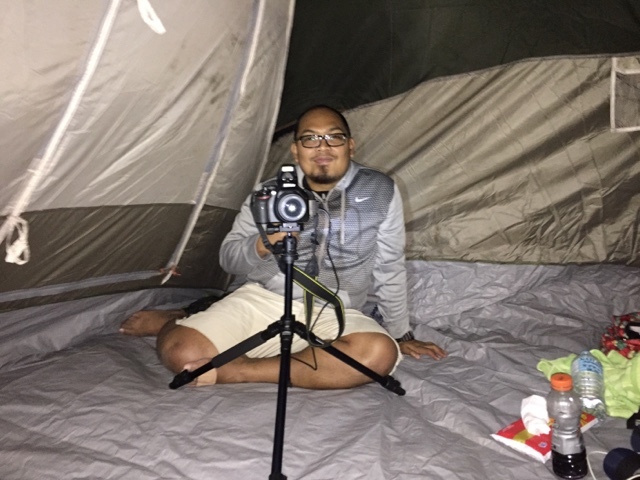 We had our guide Kuya Randy who accompanied us all the way up to the peak and helped us set-up our tent. It took us an hour from Mantalungon market to the foot of the mountain. Climbing up will require you another 20-25 minutes. Be sure to have a good pair of comfortable of rubber shoes. Before reaching the top, you will start to feel the thin air so if you need to take a break then feel free to do so! And while resting you can start enjoying the view of the town. When we reached the site (around 4:30 pm), our guide showed us 2 areas where we could build our tent and pointed out the peak itself. We rushed to the summit and see the majestic view across the town. 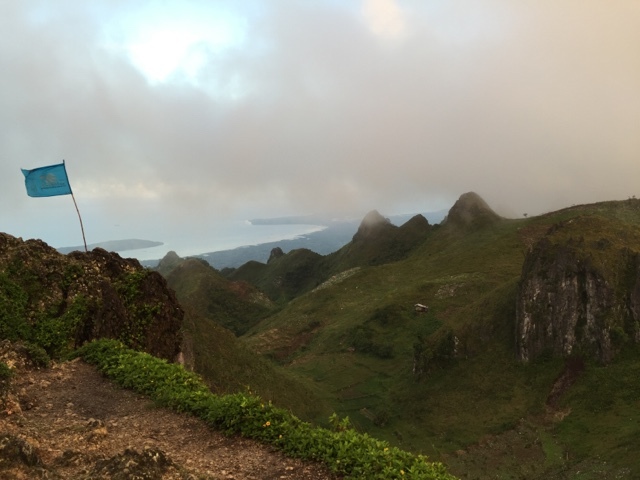 · Northwest from the summit, you can see Badian shorelines and island. · Southeast from the summit, you can see the remaining vegetable farms of Mantalungon. Indeed a very good time to see the sun set from up above, but due to the cloudy and windy December season, sunset was not very visible although we can still get a little peek of it. Then we build our tent. This could be one of the longest nights we (Kokobear and I) ever have. Tent is set as early as 5:30. A very early dinner at 6:00 pm. We bought lechon manok, chicharon and puso from Mantalungon market for supper.The night falls fast, a blooming night; wind howling, cold almost freezing, and hearing the sound of night — from nocturnal animals; crickets I guess. As the wind hits harder, we feel that we need to add some more rocks inside and outside our tent to keep it from being swept away. The night was young but we’ve been in and out of our tent ensuring that we keep it strong enough. Good thing we’re equipped with flashlights!!! We lied down and started to rest until we heared a complete silence, (tick-tock-tick tock – the sound from our watch) . . . and in a few seconds we could hear a stronger wind howling, seems like going around our big tent (we borrowed from my Aunt – that could actually accommodate 6-8 persons!!!) and blows right into it! This has been the cycle all night long… Couldn’t help but feared of what is next! So silently I prayed all the prayers, including The Creed, all ready and keep asking the Lord to please let us survive and let the wind stop. But it never stopped. Koko did his share of prayers too! I’m not writing this to frighten you but I am sharing because this could possibly what you will experience if you plan to do an overnight. Nevertheless, I didn’t regret having sleepless night because the reward comes in the morning! Aside from the stunning Mantalungon range that are grouped together overlooking and stretching up to Badian shores, the breath-taking sunrise made us in awe of God’s greatness! “Maka-tindig balahibong” amazement ang feeling when the sun smiles right in front of us at the summit. Almost reaching it! All I say was… “wow”, you are amazing Lord!!! 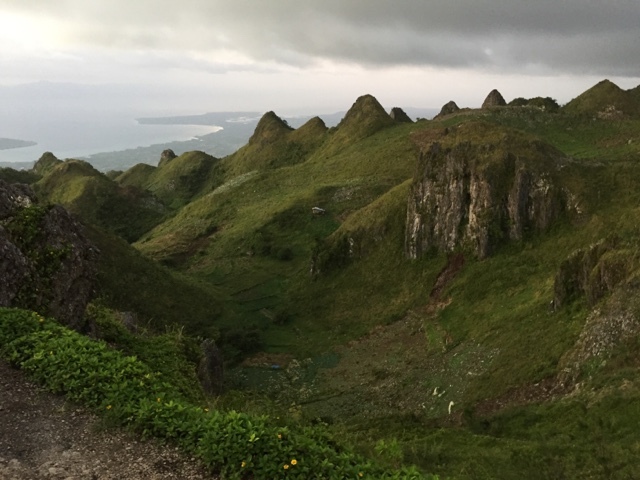 Osmeña Peak – from afar, they look similarly to Bohol’s Chocolate hills; only this multiple hills are not fine, they are jagged hills with thinner and sharper-pointed peaks. 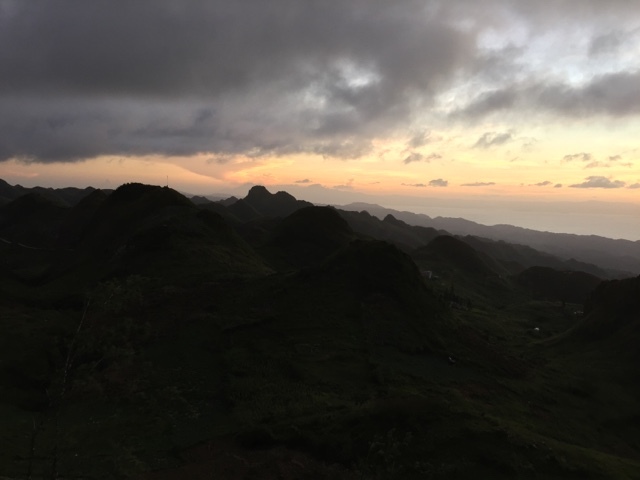 The highest jagged peak of these mountains was named after in honor to one of the popular political clan of Cebu – The Osmeñas! Early morning at 5:00 am (9 Dec) we heared a couple with their guide being on the summit already. Also amazed with the view, you can never stop taking memoirs! We stayed until 8:00 am onsite, capturing all photos possible of the mountain ranges, of the sun, jump shots, 360s and all. And will surely give another “we will come back” remarks! What an awesome adventure! The views look amazing!!! Obsessed with these shots!! Can I have your life pleaaaase?? You’re welcome Ann! God bless! Thank u so much Tereza! It look like a really good adventure. Are there any animals? Sounds like you had quite the adventure. 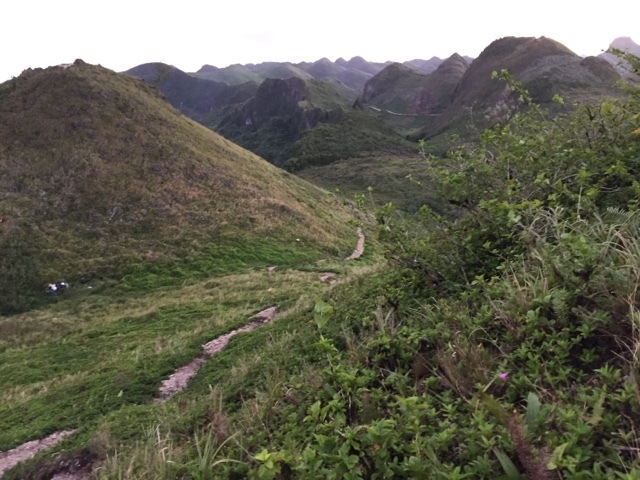 I definitely would want someone local to help me with this climb 🙂 Although you didnt get a good night’s rest, it sounds like everything else was well worth the hike. This must be an amazing experience as the photos looked breathtaking!! I have never camped out in the wilderness before and admire your bravery and dedication. This makes me miss the Philippines so much! I can’t wait to be there. Hi Chrissy! From where are you sa Pinas? This looks absolutely amazing! I’ve never been to the Philippines but hope to go some day. Thanks for sharing your adventure! Looks amazing! Camping out there would be so much fun!